Food is the fuel that gives us life. We are what we eat, which is why it is important to inject mindfulness into our eating habits. Eating right for your body and lifestyle should taste as good as it makes you feel. 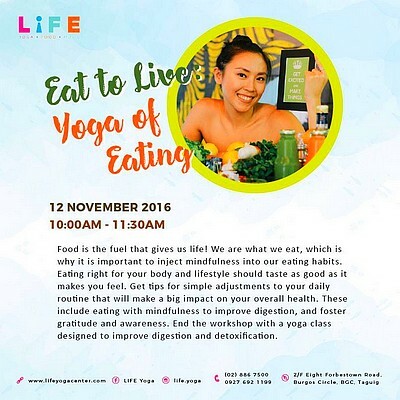 Get tips for simple adjustments to your daily routine that will make a big impact on your overall health at the Eat to Live Workshop, happening on November 12, 10 a.m., at LiFE Yoga. These include eating with mindfulness to improve digestion, and foster gratitude and awareness. End the workshop with a yoga class designed to improve digestion and detoxification. Registration fee is P1,000. For more information, go to the LiFE Yoga Facebook page.